By one of the most complex group itineraries I had ever compiled, seven of us from four different cities had managed to make out way to cloudy Anchorage in early August. Our age and increasing conservatism was showing: we all wanted to be "on the water" by Saturday, August 11th, but had all shown up a few days early, in part to adjust to the jet lag, and not wanting a potential airline schedule foul-up to metastasize into the core of our activities. Susie and I had the longest trek, since flying to Alaska is comparable to going to Europe for us. We took Wednesday afternoon off, and boarded a 2:50 pm flight to Atlanta. That was followed by a deliberately long wait in the Crown Room, a great opportunity to sample some fermented grapes, while we readied ourselves for the Atlanta - Anchorage non-stop, a flight slightly longer than New York to London. The flight was on time, and uneventful, but it was still hard to sleep, partly because my mind was still running from work, and partly because I could see the air clearing over northwestern Canada, and was hoping for a glimpse of the mountains. 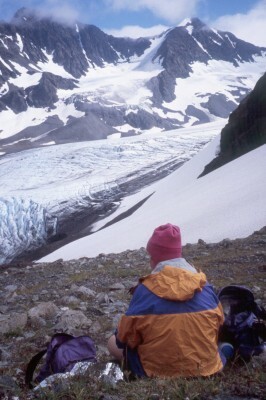 We got more than a glimpse: in the twilight, as we got to Yukatat, we could see glaciers all in the coast range, these little pointy peaks sticking up - islands in a sea of ice. Pretty special. Despite the mess at the Anchorage airport (under reconstruction, with Delta's terminal being remote from that of the other major carriers and rental car places), we had our luggage and were in bed at the less than luxurious Super 8 Motel by 12:15 am ADT, which of course, was a mere hour from when we would normally awaken. 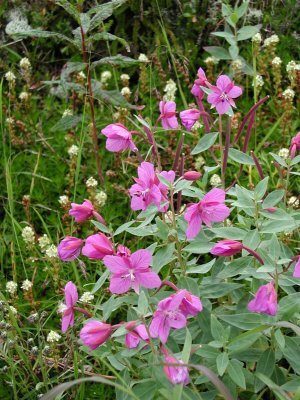 Sleep was fitful, as it is for most non-teenagers who are off their normal schedule, and we decided to get up and face what appeared to be a cloudy but rainless day. We met Andy, Sue, and their friend Dave, the latter from the biotech world of San Francisco downstairs, and headed off to breakfast at Gwennie's on Spendard. Gwennie's prides itself in breakfasts which are Alaska-sized, and heavy on real food. If you are looking for croissants and espresso, this is NOT the place to go. However, if a breakfast of three scrambled eggs, home fries, a half-pound of sliced reindeer sausage, buttered toast, a pint of OJ, and enough coffee to float your kayak (yes, I ate it all, except for the tastes of sausage I shared) in an atmosphere which is a cross between an Alaskan gold mine and a mid-west diner appeals to you, well, then, by all means, you must try it. One advantage is that you probably will not have to eat another gram of fat for a week. After catching up and introductions over this table of food, we headed back to the motel, where, typical of five very independent types, we all scattered to our separate activities. Andy, Sue, and Dave had already been up here for a day, so they were ready to tackle something constructive, whereas Susie and I were trying to adjust to a 4-hour time zone difference, and were content to visit the Anchorage REI Coop, and practice some retail therapy, always good for helping with biochemical upsets. At the Coop, who should show up but the rest of our party, Diane and Tim from Tucson. Great minds work along similar paths, for sure. T&D had arrived much earlier last night, and with only one hour time zone difference to which to adjust, and their high level of energy, they were clearly ready to rock and roll. I can't recall whether we spent more time chatting or retailing in the coop: I think the best purchase was one made by Susie: a small case that held her tiny 35 mm "idiot" camera that was waterproof and would clip to bungee cords: we wanted some film shots from the kayak deck, and this seemed to be a great idea (it turned out to be just that). After shopping downtown, Susie and I went for a 3 mile aerobic walk (is there anything else with Susie?) along the coastal trail, and checked into the Coastal Trail B&B, where T&D were staying. We met our hostess, Sherry Tomlinson, who indicated that we could use the family room in addition to our lovely bedroom for gear processing, which was sorely needed. Later that evening, Susie and I met our friend Mary, a court reporter and relocatee from Knoxville, and her new boyfriend Bill, at the Moose's Tooth Pizza. It had been several years since we had seen her, and it was great to catch up. Bill has been a real "find" for Mary - not your typical Alaskan male who insists upon living out of his pick up truck and working part time as a short order cook and the rest of the time as a handyman. Bill is a research geologist with Phillips Petroleum, and loves to do many of the outdoor things that interest Mary. Their first outing together was snow mountain biking, a perplexing sport to say the least, but one has to do something in the long Alaskan winters. After meeting at Simon and Seaforts for dinner (nice but a bit on the pricey side, even accounting for Anchorage prices, which make Manhattan look like a cheap place to vacation, but then, they have to make their money in about 3 months of tourism), we headed back to our respective accommodations. 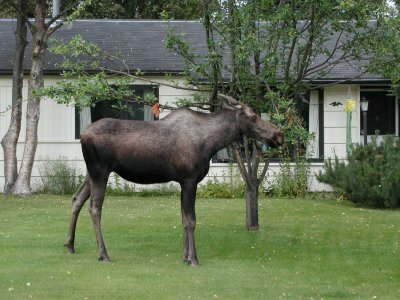 A moose, grazing on crab apples in our B&B's neighborhood, only temporarily slowed the on-coming apprehension that I could see building up in Susie. It was clear that, offered an acceptable excuse, she would have backed off the trip in a heartbeat. This apprehension manifested itself as frustrating indecision over the most trivial decisions (what do I wear on the shuttle boat if it is cold?) and blame placed squarely at my feet for all things totally beyond my control. The root cause of the apprehension was and still is difficult to assess, given her vast experience in wilderness travel, and her demonstrated ability on all of our practice trips to take to a sea kayak like the proverbial duck to water, but I imagine it has to do with some primordial fear of salt water, and the potential for rough, threatening weather. Diane and Tim had been to this part of Prince William Sound before on a Sierra Club National Outing, and had chosen this route based in part on the highly sheltered nature of the bays in which we would travel (the other part being, as they later finally admitted, that they actually wanted to SEE some of the lovely territory through which they had paddled before, but could not at the time, due to a frustrating amount of drizzle and low clouds). But no logic could sooth the apprehension. It was not a good foot on which to start off.